This was something I wanted to try for a very long time. Finally did this..According to what I know, this wine is very 'powerful' and strong. Its best for someone who has undergone an operation and lost alot of blood. It's chinese tonic for the blood and helps with blood circulation. So its not the normal type of wine we use for cooking. Its only added to soup just before serving. And not to be use in stir frying as high heat will kill all its natural properties. 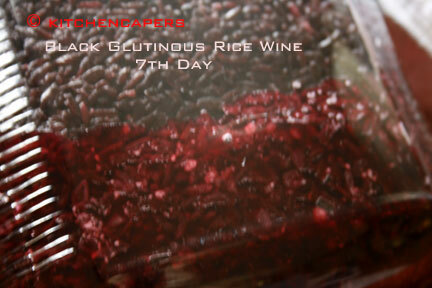 This recipe was given to me by a Chinese wine master during Chinese Wine and food tasting dinner 2 years ago. 1. Soak the rice in a pot overnight. *water used for cooking rice in a rice cooker is the same. What is different here is that you add an extra cup of water to cook. This is to make the rice more soggy, soft. 3. Remove rice once its cooked. Leave to cool completely before using. 4. Crush wine yeast till powdery and mix with sugar. 5. Mix yeast sugar with cooled rice and place it in a large jar. 6. Cover with a piece of cloth, then cover with the jar's cover. 7. Leave it in a cool dry place for 30 days. 8. Open up the cover, use a chopstick and stir in the centre...to dig a hole in the centre. 9. Stuff the black dates into it. 11. Remove and drain. Discard the rice and black dates. 12. 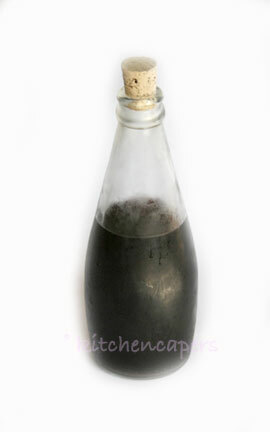 Pour the wine into a glass bottle and leave it in the fridge. 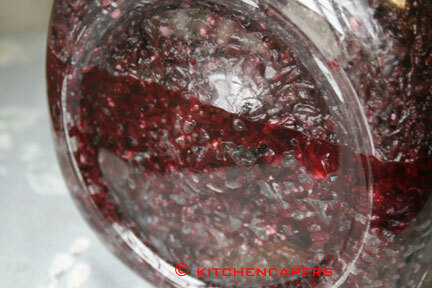 This wine takes a longer time to ferment. With black dates being dried, it will take more days for it to be soaked and be infused with the wine. The rice residue cannot be use for cooking. The rice grains remained grainy and firm. If you want to leave it outside the fridge, just heat the wine in a pot. Do not boil. Can we put less sugar or omit totally? Hi Gina, can the wine lees be eaten? How much wine did this batch yield? the sugar is added to help the yeast to 'react' more and thus you get more wine. The rice grains are firm or still grainy. If you just use yeast and rice, you will get lesser wine. it does not contribute to the sweetness of the wine. In fact, the wine is not sweet like fondant or sugary sweet. I got 750ml from it. With sugar. I have done it before without sugar and without black dates too. That one was such a letdown..only 300ml!!! Can we add the black date on the first day we make the wine? Any implication if we do that? the dried black dates need the wine to soak, soften. On the first day, there is no wine. If you put it in, it may hinder the process of the fermentation. Ok.. thanks. I'll follow your original instruction. By the way, do we need to take out the black date seeds before we put into the wine? mine was seedless..hmm, maybe I will re-edit my post. Should deseed it.